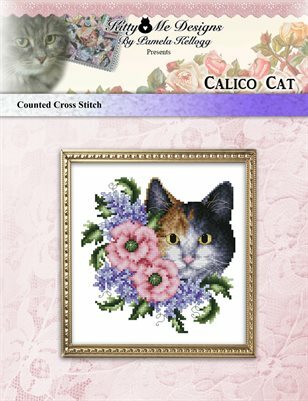 This beautiful Calico Cat Cross Stitch pattern is perfect for any cat lover! The kitty is surrounded by pink poppies and purple lilacs. The stitch count is 78 stitches wide X 83 stitches high. On 28 count Evenweave orver 2 fabric threads or 14 count Aida, the stitched area will measure: 5 1/2 inches wide X 5 7/8 inches high. Lovely as a framed piece or a pillow.